Perihelion – a world where advanced science and malevolent Gods exist side by side; where genetic engineering and occultism evolved together; where mutation is a way of life. Oh well. The game was created by only 3 people under pretty challenging conditions (don’t even ask). Taking this project to completion while going to school still remains to be the most difficult but most rewarding thing I have ever done. As far as my role in the project goes: I did all the artwork, I was responsible for the concept, the rule-set and virtually the entire design of the game, provided the story narrative (in form of about 80 pages worth of in-game script and dialogue) and handled project-management duties. In retrospect I would do a LOT of things differently with Perihelion but nevertheless, in its day it had very high production values, some pioneering technical achievements and a highly sophisticated core rule-set and combat system which we never did quite manage to polish and push to its limits. One signature element of the game was the shared, common 32-color two-tone palette which in retrospect was a pretty bold move but it was a key element in providing a unique look and a very consistent atmosphere. The game eventually climbed to #9 on Amiga Action’s prestigious “50 best RPGs of all time” list. DOWNLOAD – The full, playable version of Perihelion. It even includes a copy of the WinUAE Amiga-emulator, preconfigured to run the game (make sure to refer to the READMEFIRST.txt instructions). DOWNLOAD – The soundtrack to the game separately, in old-school .MOD format. Special thanks must go to Marek Tarnawski – apparently the biggest Perihelion-fan on the planet – for providing me with all these files. I’m often asked about what served as inspiration for the look, sound and feel of Perihelion. Well, as far as the visuals are concerned, the answer is almost surprisingly specific. 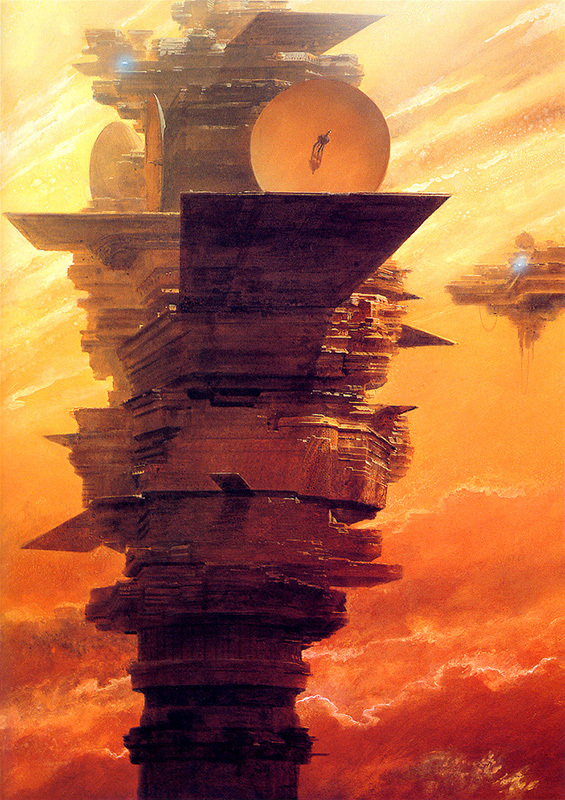 The single biggest influence on Perihelion’s art-style was this painting to the right: Microdrive II by John Harris. I was completely blown away by the atmosphere of this image: the palette, the scale, the combination of primitive monolithic architecture with sinister technology all tickled my imagination. Inspiration for the audio came from many places, the most significant of which must have been the works of several emerging progressive death metal bands we were big fans of at the time. Their ominous, heavily synth-infused sound mixed with cues taken from movie soundtracks, jazz or even classical music seemed like the perfect starting-point to get the right vibe. A prime example of this type of sound is Empire of the Sands by Nocturnus, embedded below for your listening pleasure. The parallels with Perihelion’s soundscape are fairly obvious, and paying close attention to the lyrics (which is not necessarily easy) enhances the effect even further – there’s even a reference to a “fortress of steel” included in there. And to wrap it all up, below is a pretty comprehensive summary of Perihelion’s PSI-power system which I recently reconstructed and pieced together from the manual and other sources. I remember this game so fondly from my amiga days, but the zip archive is corrupt! You are right – it was a side-effect of a recent migration I had to do. It should be fixed now. Playing it as a kid, i really was afraid all the time just because of the thrilling atmosphere! I think its very tricky but that motivated me even more. Played it till the end now 10 yars later. Thank you three and gratulations for this creation. Legend! I loved this game. I never did finish it because of a save-game bug, but would love to now! More exclamation marks needed! 🙂 Anyhow, the infinite walking bug was hillarious. Thanks for your work on the game. Gratula a készít?knek nagyon igényes kis cucc ez. Hajrá magyarok. De az a leírás tényleg kéne, mert ha jól emlékszem a 2. városból sehogyse tudtunk tovább jutni. Oh wow! If it weren’t for the fact I was constantly getting lost, this would probably be one of my fav games. The atmosphere was fantastic – I wonder what are the guys that worked on the game up to now? Emlékszem, még NAGYON régen sokat nyomtuk osztálytársakkal, bár akkor az Amiga már kifutóban volt így csak egyvalakinél tudtuk tolni ezt a remekbeszabott játékot. Mondanom se kell, azóta se találtam sehol, mert nem emlékeztem a címére. Úghogy millió köszönet a felöltésért is!!! An extraordinary great game. Thanks for that. the game is legendary. unfortunately those days have passed forever. Now they do not make such timeless games. I take my hat off. I love this game ! The Intro from this game is awesome and music too. I agrees with penszo. Nobody makes games like perihelion now. The games developers makes colorfull but boooring games. Is there any tutorial or manual about this game in polish language ? What happens at the end of the game ? Did Unborn dies ? Tha graphics to this game were super awesome. One of the best works I have ever seen on the Amiga. I didn’t play the game much, though, since I don’t like RPGs that much. I can´t believe I stumble upon this after all these years – I LOVED Perihelion, played it back in school and immersed myself in its´ very distinct and unique world even though I probably didn´t get half of the fiddly details (such as the runic system). My old Amiga 500 and all my games – including this one – was lost in a burglary ages ago, so this is a godsend. Thank you for this game, and for the memories! Probably the computer game in the world, that I would most like to see remade or made a sequel for! Love it! The most intense atmosphere and storyline ever written. Goes from suspense and excitement to downright fear. And I just love the turnbased combat system mixed with the suspense of (almost – atleast for what was possible on the amiga at that time when it came to first-person) realtime movement. You did a legendary job on that one Edvard, and Zoltans music was just the coolest! Why you guys ever did a remake? Saw this game in some old polish computer games magazine my uncle gave me (I’m against throwing away books) and… I’m speechless. Truly amazing game, thanks for letting me feel the old-school charm again! Thank you for this note and the game. This was/is game which fueled my imagination when I was a child (and this was not easy feat for the small piece of software). You should know that still there are people who are chatting about “those times” and name “Perihelion” was mentioned more then once during their nighttime conversation. I am sure I will re enjoy it today while living now in Asia. This is by far the best RPG game ever. Thanks for sharing files. Now it is like dream come true I can play Perihelion again !!! I remember when I finished the game almost 20 years ago, I made myself cup of coffee and stared all again. Perihelion was an interesting game back in the Amiga days, and the graphics were (and are still) beautiful. Since you worked on the game, how about a “making of” article that tells the story of how the game was made? That would be very interesting to read about. I also loved this game, it was beautiful and catchy. And the ending, my God, I was sad and happy at the same time, immersed in that wonderful music playing over and over, I was unable to turn off my pc for hours! Thank you for this wonderful experience. I just found this. No sleep tonight , I promise. I’m going to play this absolutely FANTASTIC fame until my eyes bleed from sleep deprevation. Huge respect for visuals, music and gameplay. I’ve never seen similar style game. And I still have to find my way to finish Perihelion. During my first fight, mobz were blocked outside the room, so I could run for a long time and gain absurd levels of speed. As a result, I never get hit by my opponents and could made the entire game with nunchakus and not using any spells. Stumbled over this via the CRPG Book Project (crpgbook.wordpress.com) last year and finally started playing. Good stuff so far, the atmosphere in particular is on point. Although it’s great that the game is available for free I wouldn’t mind actually paying a little something for it (if it were on gog.com for instance) at all. It would be interesting to port this to modern systems (Win/Linux/Mac)… is the source code available somewhere? I had Atari ST back in the day and the only time I wished I had Amiga was when I visited my friend and he showed me Perihelion. It was jaw dropping experience and to this day the game holds well. Please consider a Kickstarter and remake. There’s so much rpg dross on the market these days, and 95% of the rpg titles (if not more) aren’t even worthy to be mentioned in one sentence with your legendary game. Regards from Poland. Yeah. Kickstarter would be great. There was one exploit to the combat system that allowed me to kill Unborn in the first round – if you paralyze last enemy, you could prolong the combat and move around. Since skills levelled up with usage, I got bunch of movement points. Still, one of top ten RPG’s I played. Would love to see this ported on modern resolutions.